Eric Pace is studying a little berry with big popularity on grocery store shelves. Set to graduate this spring, Eric Pace wasn’t always sure what he wanted to do after high school but his love of animals led him to the Faculty of Agriculture. Eric’s time on the Dalhousie Agricultural Campus began as a student in the pre-veterinary science program, but after a year he realized his true calling was in animal science. A native of Truro, Eric has taken his education in animal science and applied it to his research in human health science, which, as he explains, wasn’t a big jump. Eric is specifically focusing his research on the super fruit that has been gaining in popularity on grocery store shelves – the Haskap berry. Driven by his desire to make a difference in people’s lives and supported by an undergraduate student research award from the Natural Sciences and Engineering Research Council, Eric is exploring how to protect a key bioactive molecule in this up-and-coming iconic Canadian berry during the juice pasteurization process. It’s a key molecule that unlocks significant health benefits and is one of the key reasons why people are drawn to the Haskap. 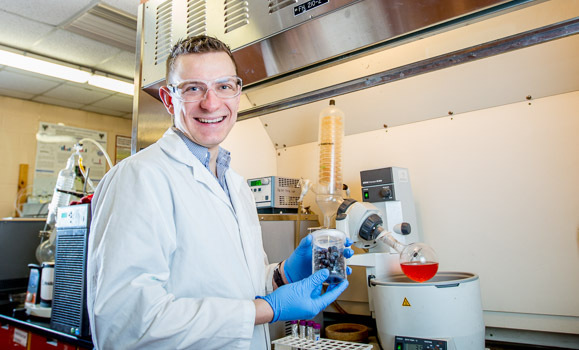 Eric is a key contributor to the University’s research team. Working under Dr. Vasantha Rupasinghe, Canada Research Chair in Fruit Bioactives and BioProducts Eric is helping to explore all of the health benefits of Haskap. “People have time for you here at Dal and you’re never just a number. They take the time to listen and to help you out – you can’t do it by yourself. Hundreds of people have had a part in my success and I’m very grateful,” he said. Building on his passion for animal and human science, Eric is weighing his options after he completes his degree, which may include medical school or a Master’s degree. He confidently asserts that an education in animal science is opening up an endless amount of opportunities and that there’s no better time to pursue a career in agriculture. Interested in making your mark on this exciting industry? Learn more about our Animal Science program at the Faculty of Agriculture.